What a beauty that is! I love those colors. I’m still sorting through all my hiking photos from last summer, and I just came across this set. This location is northeast of the huge anticline in Slate Canyon that you posted in September. The first photo (A) shows an anticline in the left foreground that looks a lot like the one from September. It’s not the same exposure, although it’s the same kind of rock (Big Cottonwood fm). The situation behind and to the right of the anticline is what I was actually trying to photograph. It looks like maybe another anticline(s) that got faulted after it was folded? The way it appears to undulate into and out of the ground reminded me of those sea serpents they used to draw on Renaissance maps. Photos A and B were both taken from halfway up the opposite (north facing) wall of the canyon; photo C was taken from the bottom of the canyon, looking downhill toward the “serpent.” The colors are a little wonky in the third photo; at that altitude (over 6,000 ft) the light is so bright that my camera sometimes has trouble dealing with it. We didn’t stop there, but I’m guessing that’s a tuff cone, a big pile of pyroclastics that built up from submarine eruptions, a la Surtsey in Iceland. Continuing with the pyroclastic theme, here’s a look at Bartoleme, where tan tuff hosts a lens of something white. I note the curved bottom and flat top to this unit, and the red shadow of contact metamorphism beneath it, and so I think it’s a pyroclastic flow deposit. I suppose it could also be a rhyolite flow. Unfortunately, I haven’t been able to successfully fact-check this “armchair” geologizing from the resources available on the Internet, so I welcome your insights. Let’s stick with the tuffaceous islands for the moment. Kicker Rock is the eroded remains of a tuff cone from a violent Surtseyan-style eruption. This beach sand can get lithified and make coquina. In this case, here’s a storm- (or tsunami?-) tossed slab, several meters above sea level, with a boulder-sized inclusion of basalt of the left side. The textures here were so photogenic; it was difficult to stop capturing them with my camera. Or how about this extraordinarily consistent braided texture? Other than that, it looked pretty pristine. What a great thing to be able to see and traverse in person! New year’s day is the time I tally up and report the bird species seen in my yard on the forested slope of Massanutten Mountain in Shenandoah County, Virginia. This is my seventh such annual list. It’s been a good year. Two new “seen for the first time ever” species for the yard are noted in bold type. That is a spectacular outcrop! The folds’ axial planes are more or less horizontal, so we’d be justified in calling these “recumbent” folds. I love, the 3D exposure; how we see them sectioned both in profile and also parallel to the bedding plane. Very, very cool. You know, the very first Friday fold ever (>8 years ago) was also from Samaria Gorge in Crete. My wife Lily was the source, before she was my wife! Jay suggested I get her to take me back there, and I’m starting to think he may be right. Happy Friday to you, and happy holidays, too. Here’s a kid’s book to consider for the holiday season: The 50 State Fossils: A Guidebook for Aspiring Paleontologists, written by Yinan Wang and illustrated by Jane Levy. It has a simple structure: each state gets a page, and that page is divided into four parts: a map of the state w/ areas highlighted showing where the fossil can be found, an illustration of the organism as it looked when it was alive, in a cartoony sort of style, a representative photograph of the fossil, and a few paragraphs of text describing the organism, its geological setting, and superlative aspects of its discovery or lifestyle. Not every state has a state fossil, but Wang rolls with the punches, presenting “state dinosaurs” where they occur, and the (fossil-derived) “state stone” in one case. For states where there are “none of the above,” Wang makes suggestions as to what would be an appropriate choice, considering the geology of the state, as well as proposed bills to designate state fossils that never made it out of their respective legislatures. This is a useful compilation of information about the range of organisms which are embraced / celebrated as state fossils. Duplicates become very apparent when reading through the whole book (as my son and I did on Monday): a lot of mammoths, a lot of trilobites, a lot of crinoids, and a lot of dinosaurs. The unique choices really stand out: belemnites (Delaware), the Tully monster (Illinois), petrified palm wood (Louisiana), and Jefferson’s ground sloth (West Virginia). My own state, Virginia, has the elegant Pliocene scallop Chesapecten jeffersonius as its state fossil for many good reasons. I have a couple of personal connections to the story of that bill, and am pleased that its story is included in the brief description. In 1687, it was the very first fossil from the Americas to be illustrated in the scientific literature. So illustrating it is key to its selection, and it pains me to say that the photo used to illustrate the fossil appears to be another species in the Chesapecten genus, perhaps C. middlesexensis or C. madisonius. You can count the ribs – C. jeffersonius should only have 8 or 9 ribs, but the individual shown in the photo has 12 ribs. I found one small typo too. These are relatively minor details, and for the intended audience of paleophile children, I don’t think they matter in any essential way. I think the book would make an admirable addition to the bookshelves of young paleontologists. My son (6 years old) really enjoyed it, and has gone back to it several times since to leaf through and re-examine the critters. He’s particularly taken with Shonisaurus, the Nevadan icthyosaur! It’s time for another guest Friday fold! This one comes to us from Nathan Niemi of the University of Michigan. an aerial view of the Titus Canyon Anticline in Titus Canyon, Death Valley National Park, looking to the northwest. The fold is cored in the lower Paleozoic Zabriskie Quartzite and Wood Canyon Formation (brick-red bed at right), and the overlying middle Paleozoic Carrara Formation (shales and limestones) is detaching from the Zabriskie and forming the tight, prominent fold in the center of the photo. The dark gray rocks to the left are overturned upper Paleozoic carbonates of the Bonanza King Formation. Thanks for sharing, Nathan – what a great view of a great structure! I found it in Google Maps if anyone is interested in exploring the local context with that tool. The South Mountains are a metamorphic core complex: a large sort of structure that is moderately common in the mountains of southwestern Arizona, but also present in other areas of the world. These metamorphic core complexes are characterized by a dome-like blob of exhumed rock rising up, and overlying rocks slipping off the top. The rocks that pooch upward in the middle of the complex go from deep, hot conditions to shallow, colder conditions. The deformation they experience thus starts off ductile, and then transitions to brittle as they make their way up to the surface. The principle of cross-cutting relationships reminds us that when one geologic unit or structure cuts across another one, the cutter must be younger. 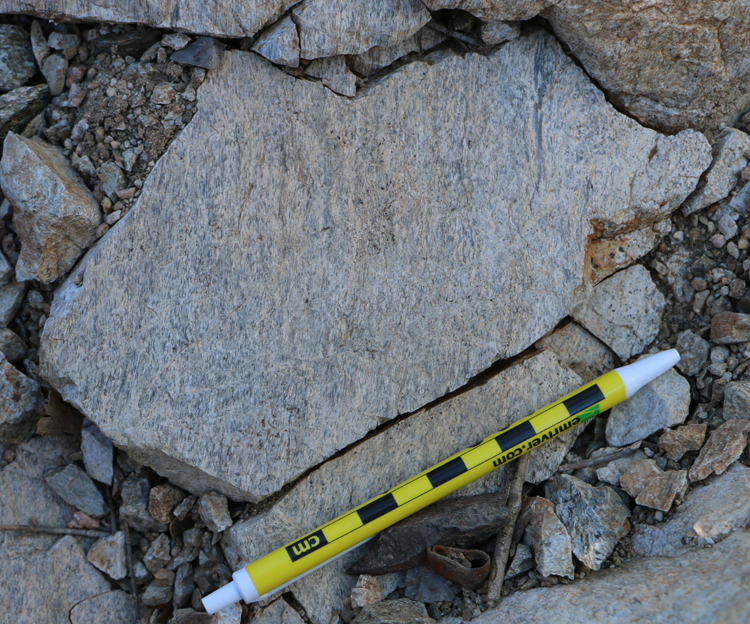 At this site, the ductile fabric of the mylonite is transected by the veins of brittle pseudotachylyte. This shows in miniature the structural imprint of the granite’s journey upward through different deformational conditions through time. It almost looks like a thumbprint, or a surficial deposit of mud. But it’s not! It’s part of the rock. In the annotation, the pseudotachylyte vein’s contact with the mylonitized granite is outlined in black, the concentric flow banding is traced out in white, and my interpretation of flow direction is shown with the yellow arrows. I first saw these rocks in January on a field trip that Steve led for the Structural Geology and Tectonics Forum, but I didn’t have nearly as much time to explore the site then as I did this past Thursday, when I was lucky enough to find myself in Phoenix with a free afternoon, and good company in the person of my former student Stephanie Sparks, now working on a PhD at ASU under the supervision of Kip Hodges. Stephanie and I saw some other cool outcrops on our field trip, and I’ll feature them in future posts later this week.